Did we mention we work with Leo Villareal? We do. And here’s another piece out in the public that we’re glad to have been a part of. 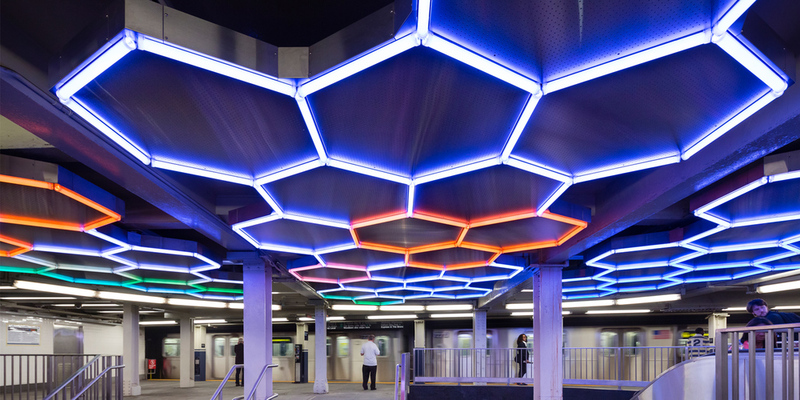 Hive was officially revealed to the public this September of 2012 as part of the long-awaited Bleecker St transfer for the New York City MTA. 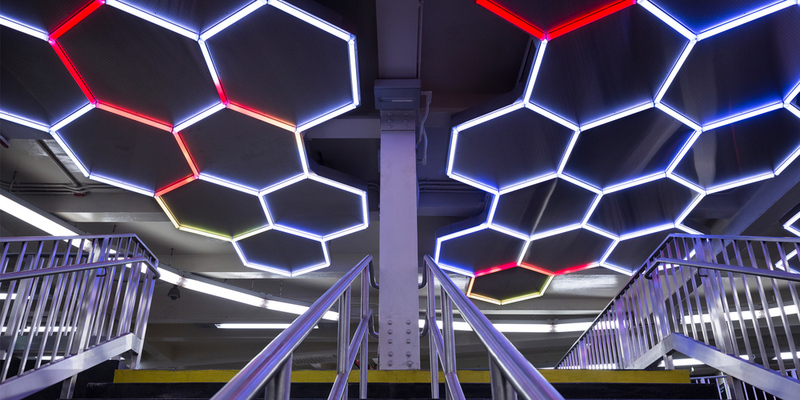 It’s one of the more ambitious projects undertaken by the MTA’s Arts for Transit and the first LED-based artwork for the organization. 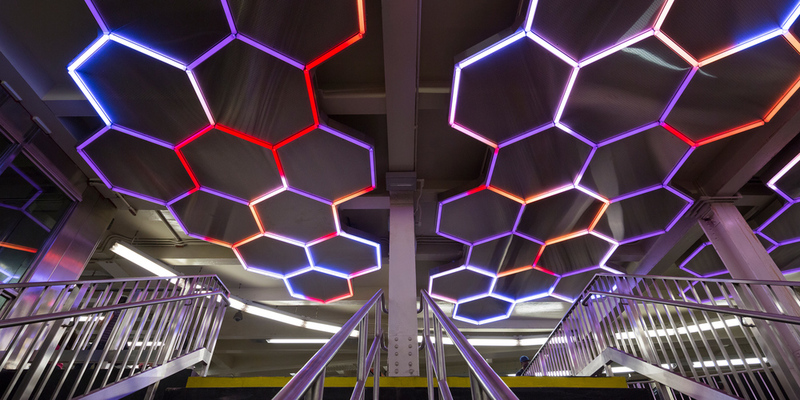 The New York City subway system presents unique challenges to any installation, artwork or not. It’s a harsh environment and we learned through the course of the project that the artwork would be subject to potential hazards such as water ingress, vibration, wind loads, steel dust accumulation, graffiti, and the wildcard: late night riders that will swing from anything within reach. Working with MTA engineers and Robert Silman Associates, we developed a robust aluminum structure clad in stainless steel to support and accent the artwork. The design went through a number of iterations for structural integrity and galvanic corrosion resistance before entering production in January 2012. It was right around this time that our Mori-Seki CNC decided to crap out on us. We quickly sourced a new Haas and borrowed a rotary table to plow through production far faster than we could have imagined. Each cluster of the installation was staged, labeled and tested prior to delivery at the site. On time. 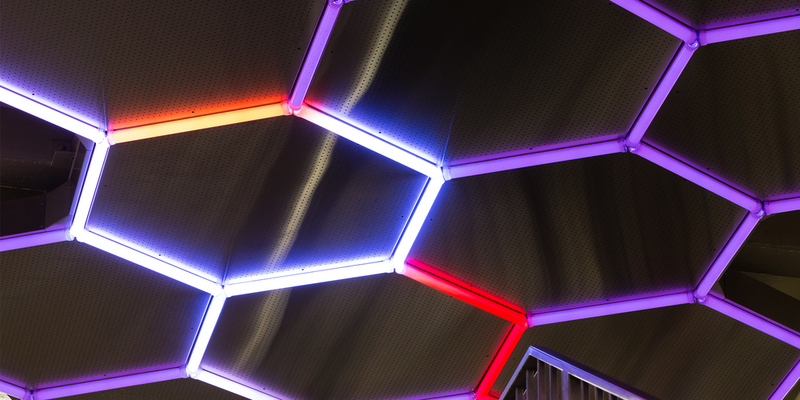 To see Hive for yourself, take the Uptown 6 from Houston and Mulberry Streets, or transfer to the Uptown 6 from the B-D-F-M at Broadway-Lafayette Streets.